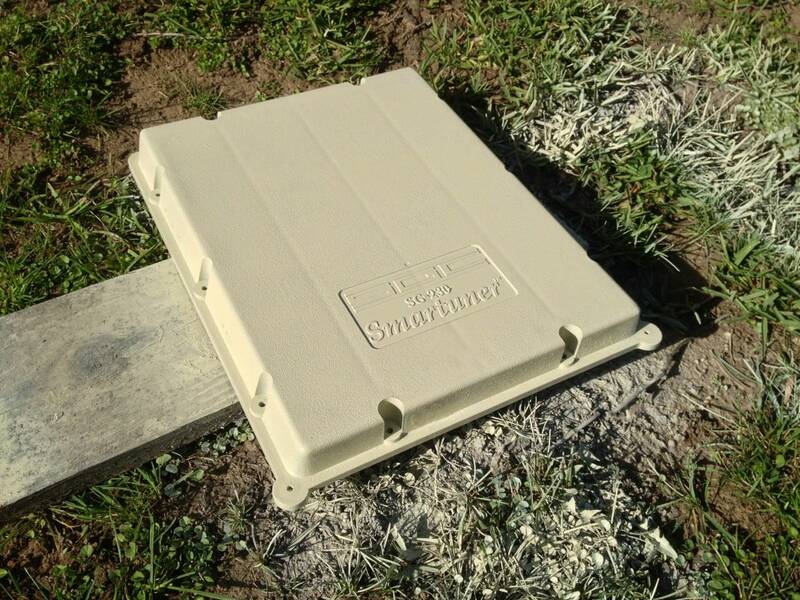 I am planning to have my first Mesh node installed near downtown Saratoga in the next couple weeks. I have successfully flashed one wireless router already and will be doing more in the coming days/weeks. I also plan to eventually help other ham friends set up nodes around Saratoga, Fremont, and possibly West San Jose after that. With any luck we will be able to create a usable network. Does anyone know of any other active nodes in any South Bay Area towns? Such as Saratoga, Los Gatos, Campbell, Sunnyvale, Cupertino, or San Jose? If so how can we get these nodes listed on the map for this website. I found this map online and was hoping it was a map of Broadband-Hamnet node locations in the South Bay: ( http://comopview.org/scewn/ ) Is there any chance this network is linked to Broadband-Hamnet? Could anyone shed some light on this please? Also how do I add services other then internet access to my nodes? Such as File Sharing, Web Cam, VOIP, Instant Messaging, Email, or APRS? What kind of access will other hams connected to my node have to the data/files on my computers? Any feedback at all would be much appreciated. There are a number of people in Santa Clara County working on and learning about BBHN. A couple of us have nodes up in Milpitas. There is active work being done in Cupertino and a few other cities in the southbay. The county ARES/RACES group has just started a web page and yahoo group for those interested. We plan to demonstrate Mesh at the County wide ARES/RACES drill in April in an attempt to generate more interest. I am new to this system and still have a lot to learn. I was hoping to connect one of my nodes to my internet router so I could then access the internet via the mesh from a computer plugged into a second node at a different location? Is there a step by step walkthrough/guide, youtube video, or website that can assist me with that? Hi, this is Joe Pistritto, N3CKF in Fremont. I have a spare Ubiquiti NanoStationLocoM2 that i was thinking of putting online. Anyone else in Fremont/Newark with a HSMM node? 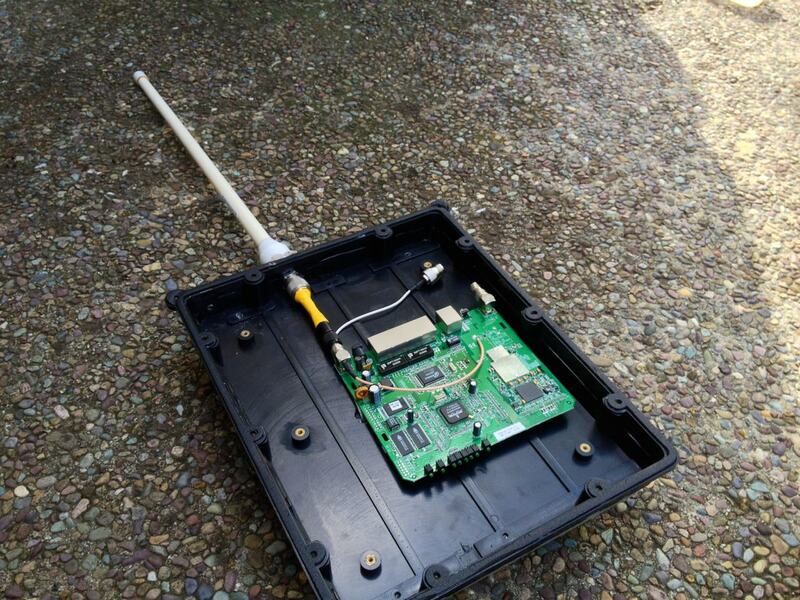 (KE6TIM) i saw your node down in Milpitas but i'm pretty sure thats too far for me since i cant put my node outside, just in my attic). VE4AAI/W6 here. I'm originally from up in Canada, hence the VE4 callsign. Operating under the good 'ol reciprocal operating agreement. I've got a spare WRT54G which I just flashed with the hsmm-mesh firmware. I'd be more than happy to try and get this linked up with someone else. 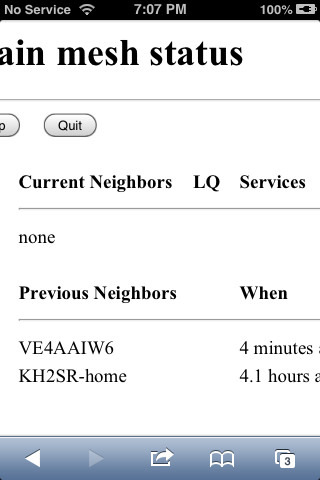 At the moment the router is sitting in my apartment, so I doubt anyone is going to pick it up. I suspect my building is going to make this a pretty big challenge. My patio is on the main floor of a 2 story apartment building. My lease terms make it clear that I cannot put anything on the roof either. South of me is another building as well. What kind of antenna on Amazon would you recommend? There seems to be quite a range from cheap non-directional antennas to fancier directional ones. I'd try a dish, but I suspect I'd be out of luck for aiming it South. Tyler, With a building in the way I think it will be difficult for our two nodes to connect. If you leave yours up and running I will try to aim my antenna your direction sometime this week or next weekend. Try to position it near a south facing window. Just make sure you don't use a very long coax cable between your node and the directional antenna you eventually get. I know we currently don't have good odds of making contact with each others nodes or the one in Milpitas. However I think if we both set up nodes and list them on the map: ( http://www.broadband-hamnet.org/googlemapped-mesh-nodes.html ) other hams will see that there are new nodes showing up in the area and that might be the extra push they needed to do the same. 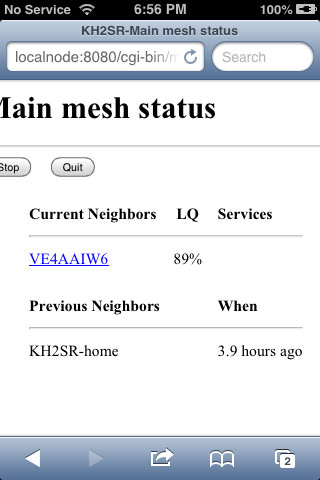 I think contacting our local ham clubs to ask if they have any mesh nodes setup in the area would be a good idea. If so suggest they list them on the map. If they don't have any mesh nodes then suggesting this as a project for their group to work on would be a good idea that they will probably appreciate. 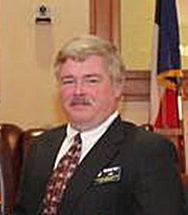 I also plan on talking to several other hams I know into setting up nodes of their own. I think if we can get the ball rolling then this could easily snowball into a decent sized bay area mesh network. Feel free to post a message on here when you get your node listed on the map and I will do the same sometime this week. I have a friend in Fremont who is planning on setting up a node with my help. Not sure when it will go live, maybe after next weekend. So check the map every few days. Maybe we will have it up and running and on the map by then. If you have your node setup already, post it to the map and we will try aiming your way in a week or two. 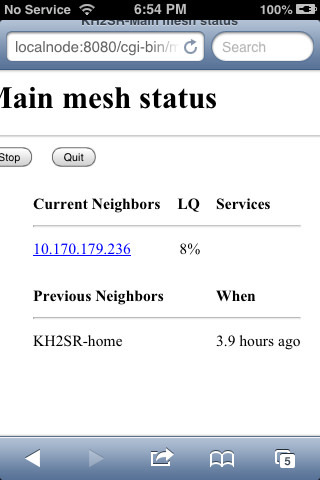 Just listed my HSMM-MESH node in Saratoga on the map. Now its time for some other south bay hams to do the same. Spread the word to your friends and ham clubs. Lets get this network built. That's a nice looking antenna. So that would be quite directional though, correct? So how does that work, do you need two of those? 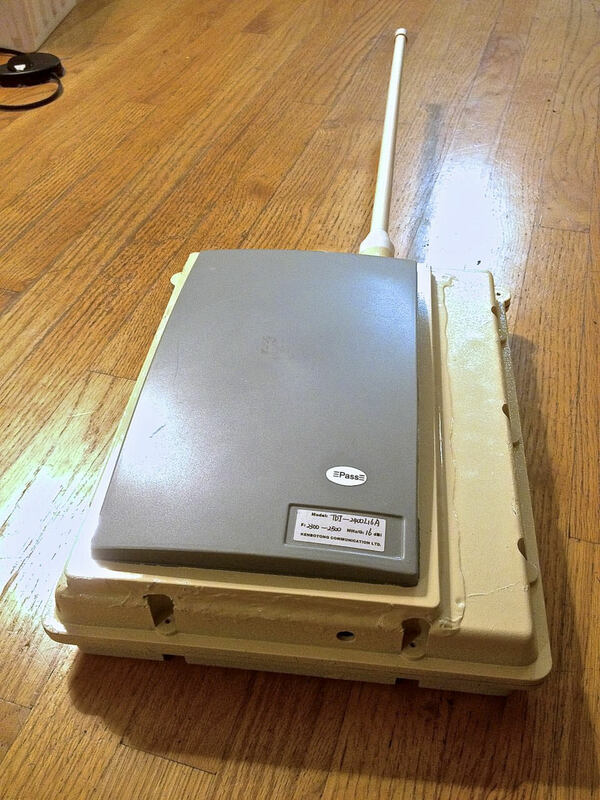 My WRT54G has two antennas.. The nice thing is this equipment is so inexpensive it's easy for anyone to try. I'll definitely add myself to the map. It'd be neat to see this up and running. I studied mesh networking during my graduate studies; it's a really neat way to set up a wide area wireless network. Yes, they are quite directional. You can use two directional antenna and have them pointed in different directions or you can use one directional and one omni like I did. 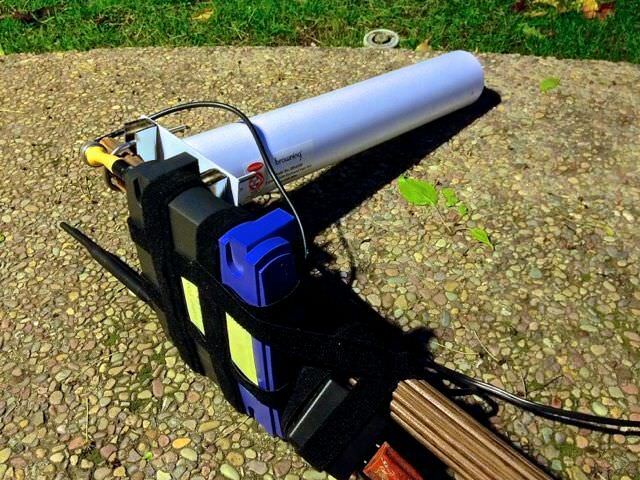 I have done a temporary setup of a node on a 10 foot pole which is then held another 5 feet off the ground with a directional antenna connected to one of the antenna jacks and a simple omni-directional antenna connected to the other antenna jack. Instead of running a long ethernet cord up the pole with POE (Power Over Ethernet) I ran a heavy duty AC extension cord up the pole to the wall adapter. I found this to be a much simpler and definitely cheaper option. I also don't need an ethernet connection between this outdoor node and my computer because I have two more nodes in the house which I can connect via ethernet which in turn are connected to the outdoor node wirelessly. Everything is held on with long strips of velcro strap. I will eventually build this into a waterproof box and attach it to a taller and more permanent pole. 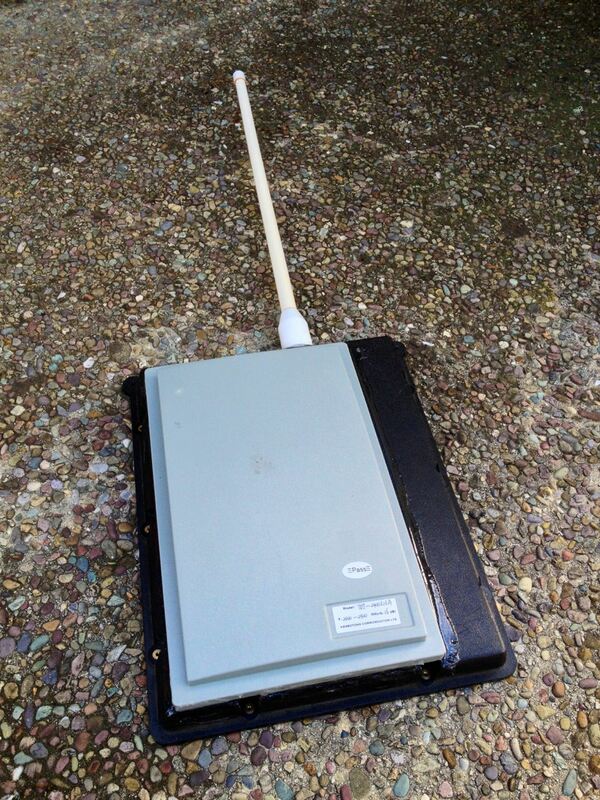 Let me know if you get a directional antenna for your node and we can try making contact sometime. If we could get some more hams/ham clubs to set up nodes around the area it would greatly increase our odds of linking our nodes. I think we need to try to spread the word about HSMM-MESH and get more people to put nodes on the air and listed on the map. If you happen to be part of a ham club or have any ham friends or family in the area, consider helping them set up their own nodes as well. I have attached a couple photos of my temporary directional node on a pole setup. I've done my part, my node in on the air and has been posted to the map in Fremont, CA! Now we just need more hams to get on board with this fun and cool project! Here are a few photos of the progress I have made with one of my nodes. This one will be installed on a 21 foot fiberglass mast that will be in my side yard in a week or two. It has a 8.5db gain omni antenna as well as a 16db gain directional antenna. I will be able to rotate it from the base of the pole to aim it in different directions. I will run an AC power cord up the center of the hollow fiberglass mast and the power supply for the node will be installed in the waterproof box. The box has been painted white to reduce heat build up internally. I also plan to install a DC input port on the box so the node can switch from grid power to solar/battery power. If anyone has any suggestions or questions feel free to post. Nice work James, I presume that is a Wrt 54g in there? I usually join any I find so I can see what others in the world are doing with BBHN. One time I was out there, about a year ago, I tried scanning the entire valley with a MFJ stamped yagi on a node, but with no one probably pointing up at us, I didnt see any other nodes. Thanks Tyler! Yes thats the guts of a WRT54G in there. I was looking at the ubiquity units as well. 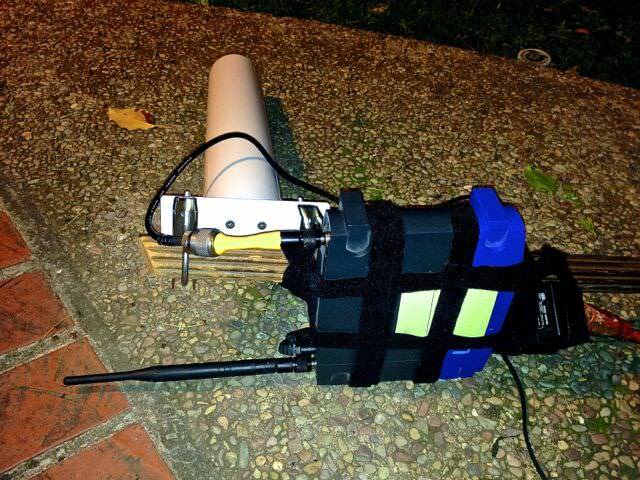 Another option is to add on a 2.4GHz RF amplifier between the antenna and router. There is a wide variety on amazon. I plan on getting a couple eventually. We definitely need to work on spreading the word to more hams so we can get more nodes on the air in the bay area. If you happen to have any ham friends try talking them into it. On another note, I installed a node in my car. That way I can try to track down unlisted nodes while I drive around town. I Haven't found any yet though. I happened to be in your neck of the woods for work last week and decided to drive by and see if I could pick up your nodes signal. As luck would have it our nodes were able to connect. I thought you might be interested so I took a couple screen shots from my iPhone while our nodes were connected. The screen shots are attached to this message below. I just applied to the same yahoo group. Guess I will keep my fingers crossed and hope they accept me. Sounds like your friend has an ideal location to set up a few nodes with directional antennas. I am doing the same thing on the other side of the valley and should have one up on a 21 foot mast with a directional antenna in a couple weeks. If your friend is a ham you should talk him into setting up a few nodes and directional antennas up there and aim them down at the valley. If he is not a ham you should talk him into joining our ranks. He used to have his license back in the day when you had one year to upgrade from Novice, but he didnt, so it expired. I have sent him a link to the Sunnyvale VE group. I sent him a link to this forum showing y'all were lighting things up out there, and he knows my (blonde) wife got hers last year, so HE should have no problems getting it again (shaming him into it :-) ) He just got and is playing around with a cheap SDR USB dongle (25-1700Mhz), so maybe it will help spark the bug. If you look at the picture I attached to my last post, you can see the view (pic taken with my HTC phone i in panorama mode from his front porch, not even up on the roof). Milpitas to Alum Rock. I think I labeled the airport too far to the right though. If he were to put up a node or 2, I dont think he would have any problems linking into anyone (as long as they aim back). Next time I go out, (if he doesnt by then), Ill bring out one and a good ant to try again. Ill make sure to post here when I do so someone can try aiming up his way. I know there is an amateur group at work; I wonder if I can drum up enough interest that we can convince the company to let us put up a node there.. That'd be Mountain View. Hey neat idea of connecting from your car. Did you use two nodes so you could get access via your iphone? Cool! Nice to see you could pick me up. I wonder why I don't have anything showing up in my mesh "recent history" list. I guess it must clear itself periodically or something. How far in to the complex did you need to go to contact my node? Right near the building? Or were you able to stay on one of the main roads?